Herb garden planning is not a lot of work, but here are some thoughts I have put together on the topic. 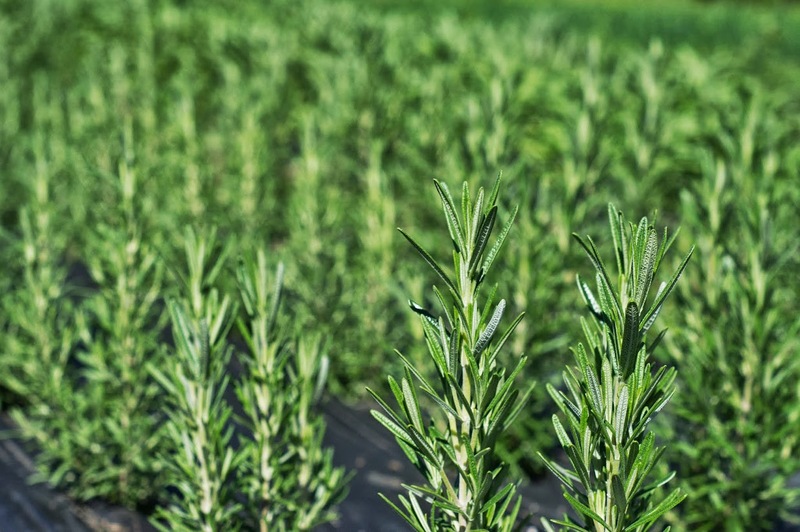 Herbs are easy to grow for the most part, but they are a big category of plants (we grow 100 varieties of herbs) and it helps to break them down and organize them into categories. 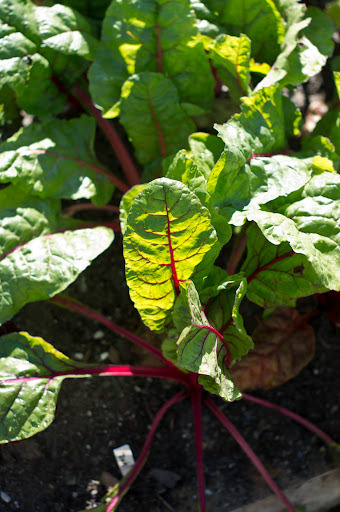 This will help any gardener plant the right plant in the right place and give it the preferred amount of water, sunlight, food, and water. 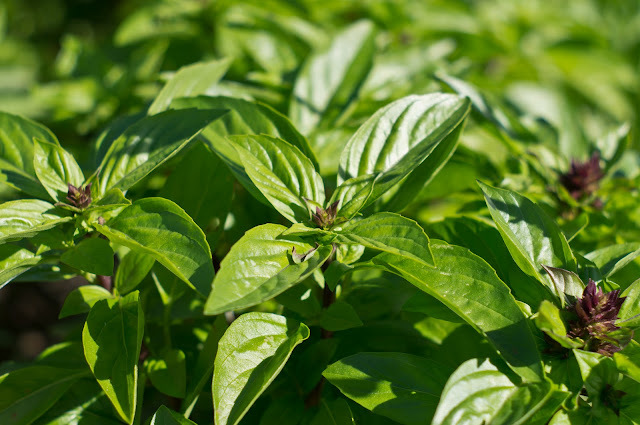 Why grow herbs? For flavor, fragrance, and beauty - it is the easiest way to improve the flavor of what you cook. 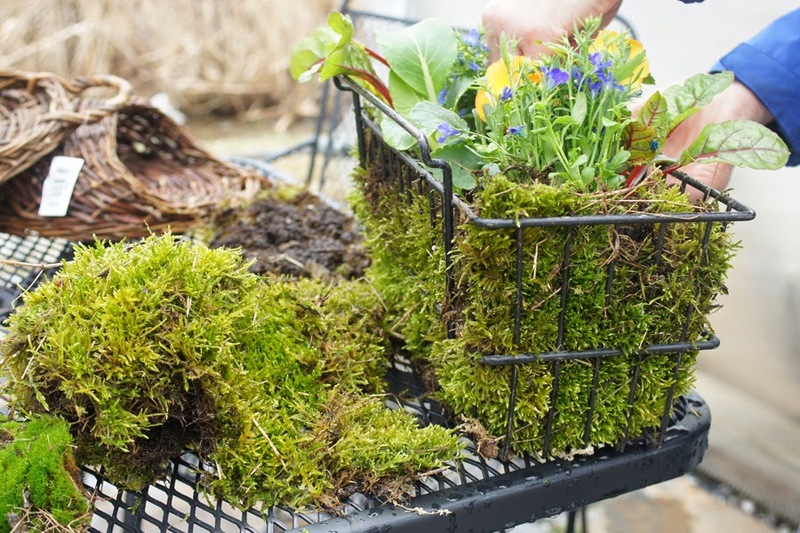 It is also one of the easiest ways to have a container garden on your porch or deck. 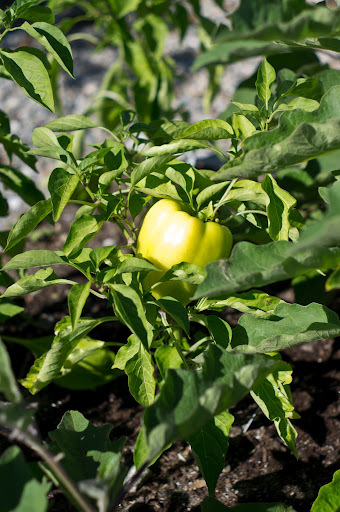 Herb gardening is intimate - you get close to the plants, smell them, taste them, see them respond to regular clippings. They are a perfect way to better understand plant physiology and the best short cut to great food made with little effort. 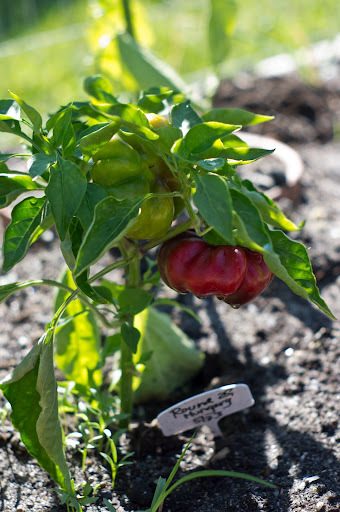 All herbs can be planted from plants, and some can be planted directly into the ground as seeds. 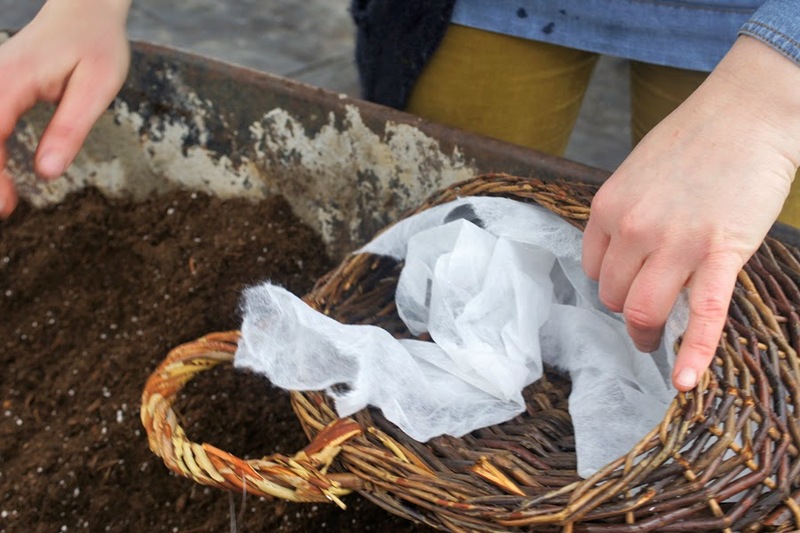 The herbs that you can seed directly in the ground and expect great results are: cilantro, dill, and chamomile. 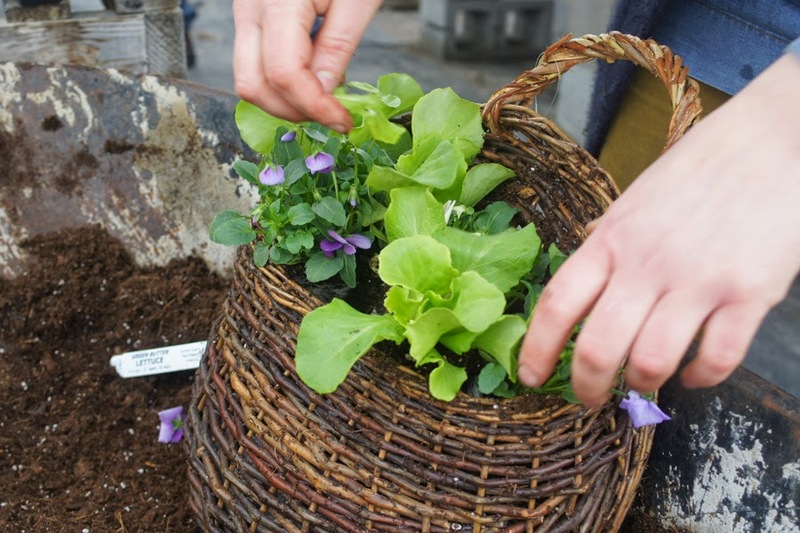 Everything else will do much better if you start the seeds in containers in a sheltered environment. You can start your own herb transplants easily if you have grow lights and a heat mat. 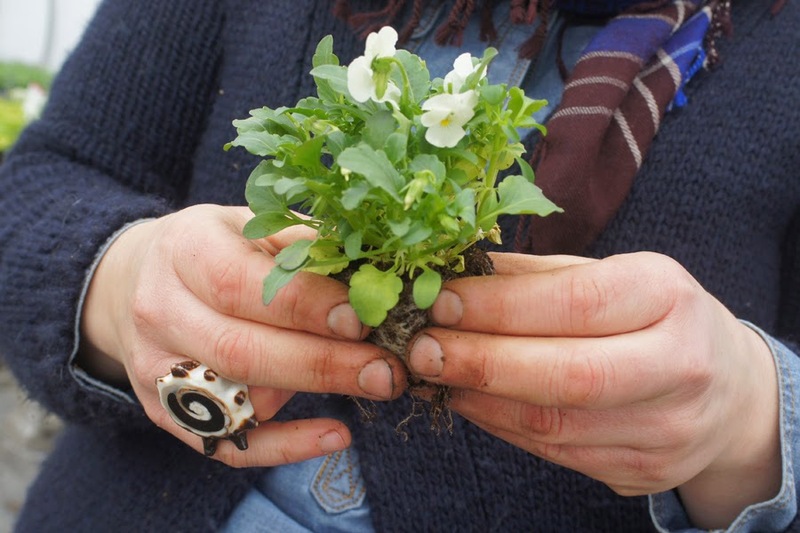 Many herbs take a long time to germinate and many herbs are propagated only from cuttings. Making your own rooted cuttings is possible too, but that takes a little more of a sophisticated set up with misters, rooting hormone of some sort, and humidity domes. 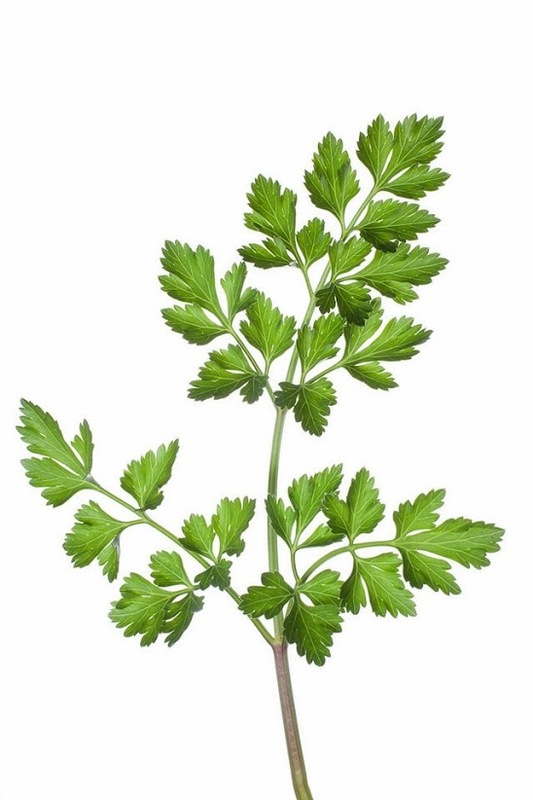 For those herbs, it is generally easier to purchase the plants. Some plants love to be planted in the ground and others would prefer to be in pots. Generally speaking, the herbs that like it dry and warm will prefer to be in a clay pot that breathes like Italian terra cotta. Plants that like it wet and cool might prefer to be in the ground, but they can also be grown in pots if the right conditions are given (more watering, a glazed or plastic pot, heavier potting soil, a little shade). 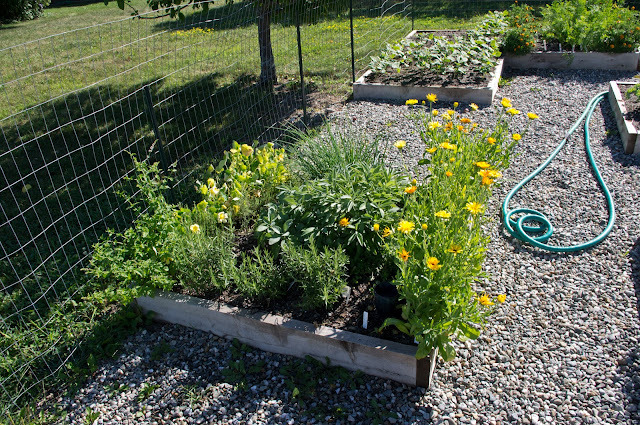 Herbs that prefer to be in containers in Vermont: EVERYTHING ELSE! This does not mean that you cannot grow herbs in the ground, it just means that in containers, it can be a little easier. Some herbs do really well as tiny shoots for micro-greens: chervil, dill, cilantro, basil, fennel are our favorites. And they are easy to grow indoors year round – just pat down some moist potting soil in a shallow container (only need 2” or so of soil) with holes in the bottom, press in the seeds, cover very lightly with a thin layer of soil, and keep moist. When the first set of true leaves begin to emerge, they are ready to eat. 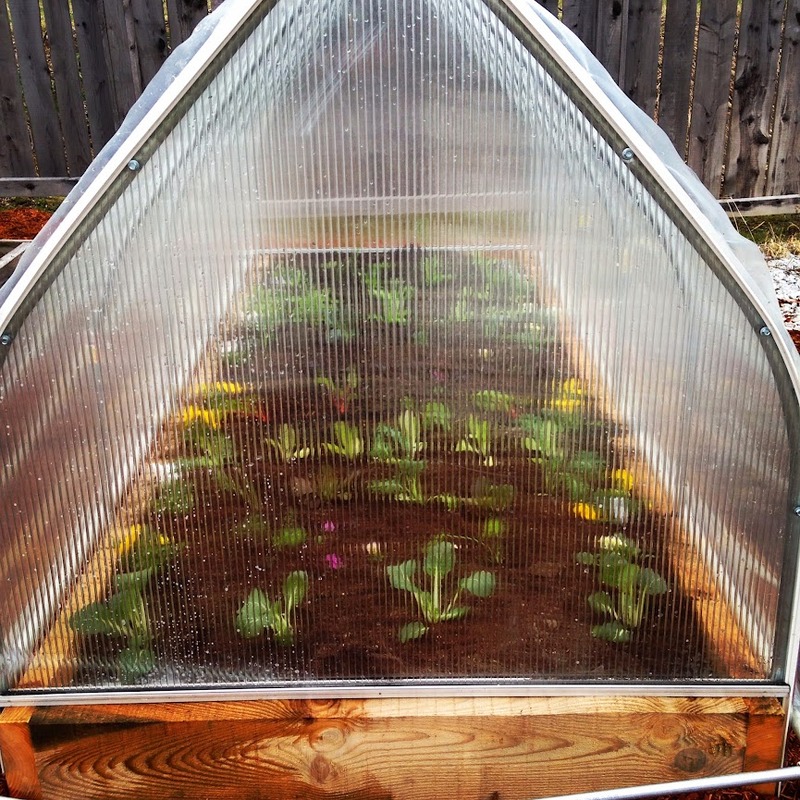 You can also grow pea shoots and sunflower sprouts this way. A south facing, sunny window is sufficient. You can bring in potted herbs in the fall and keep them in a sunny window for use during the winter. 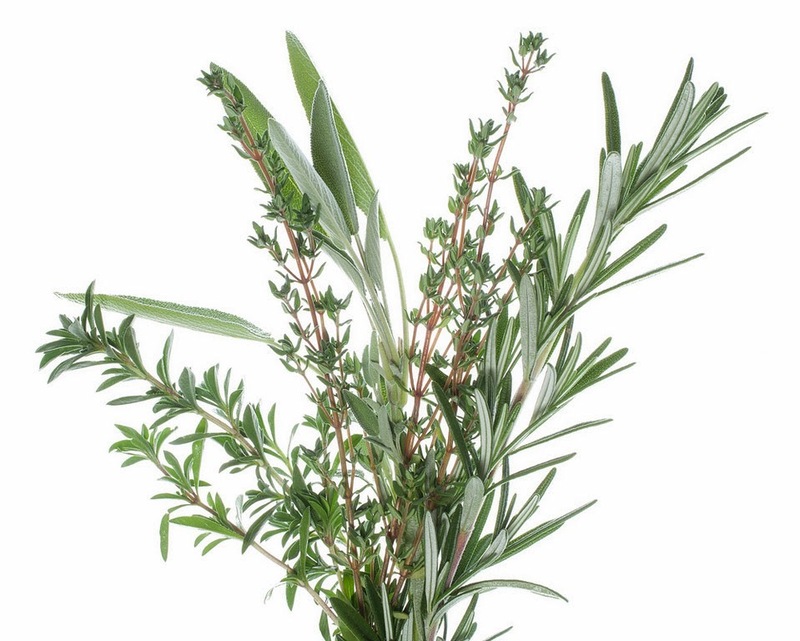 The herbs that do best with this treatment: sage, parsley, rosemary, thyme, and savory. Basil can be brought in as well, but it won’t be terribly happy unless you have grow lights for it. If you had some of these herbs planted in the ground, you can dig them up and slowly acclimate them to being in a pot and being indoors. Herbs can be dried or frozen or infused in vinegar or simple syrup for year round use. Pesto or herb pastes made with oil or water can be frozen in small containers. Drying is very simple or very elaborate – you choose! A dehydrator can be used, and the leaves can be stripped off of the stems once dried and stored in jars in a dark place. 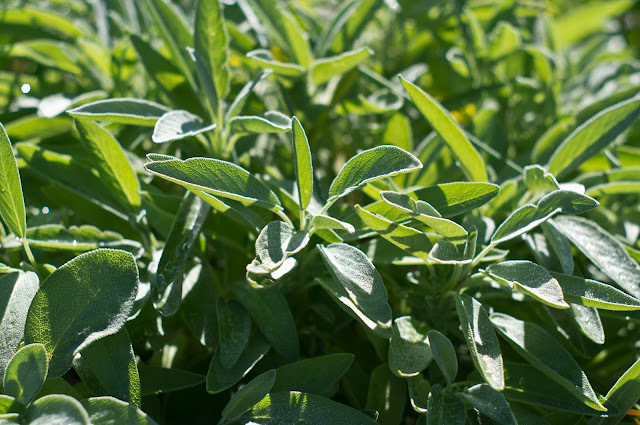 Or you can go the simple route and just harvest whole branches of the woody herbs such as thyme, oregano, rosemary, sage, and winter savory. 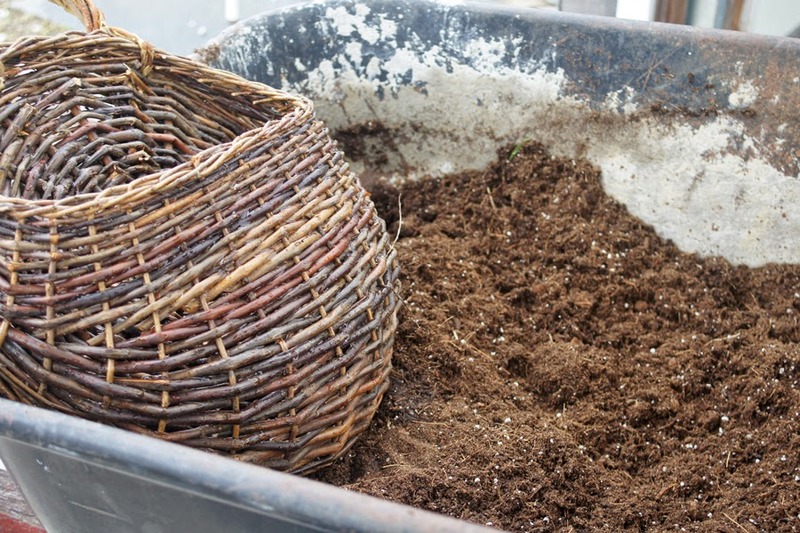 Place the branches in woven baskets and keep in a dark, well-ventilated space. They will dry just fine on their own, and you can keep them covered with paper bags or kitchen linens and use as needed. Cooking with Herbs with Molly Stevens and Julie Rubaud – a class and dinner. April 4th 10 am to 3 pm. 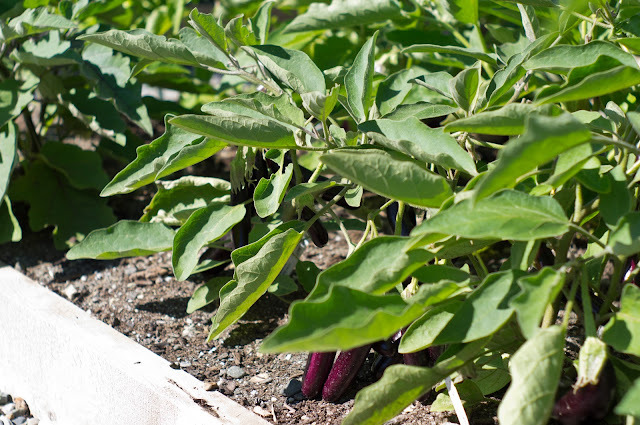 Tour the greenhouses and see behind the scenes. Help us kick off our season with a bang! (Part 1 of 2. See Part 2 for information about promoting butterfly and hummingbird habitat). 1. Flower-rich foraging areas and water source. 2. Suitable host plants or nests where they can lay eggs and/or raise brood. 3. Environment free of pesticides. 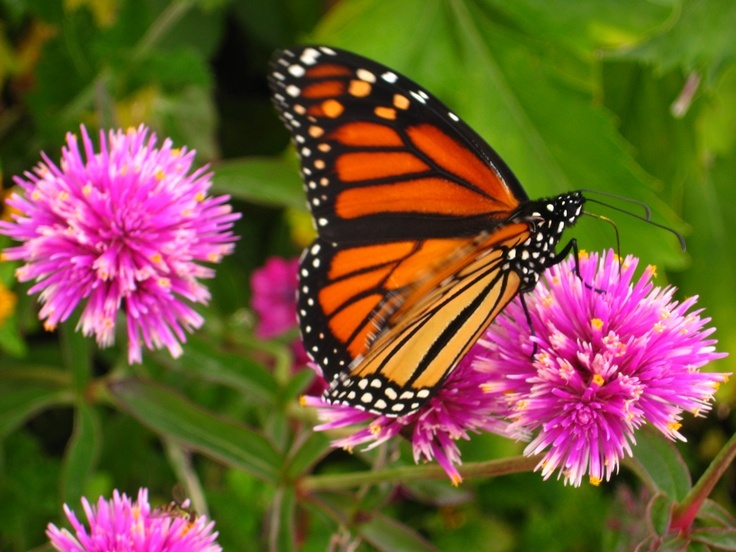 This blog series will focus on the habitat needs of bees (social and native solitary), and the butterflies and hummingbirds which are the pollinators we most often encounter and recognize in our home gardens. Of the 20,000 species of bees worldwide, 4,000 are native to the U.S. and 90% of these are solitary. These include bumble, mason, and ground-nesting bees. The domesticated honeybee is a European import. Bees prefer purple, yellow and white flowers and see ultraviolet color patterns, such as shape and color ‘nectar guide” patterns that provide clues to the location of nectar in the flower. 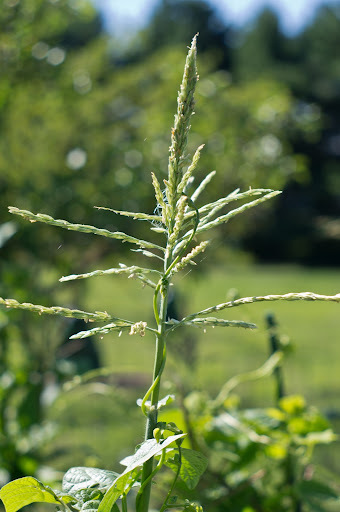 Not surprisingly, sequential bloom is important for forage all season long. So, what to plant? 1. Monarda fistulosa, Bee Balm. More resistant to powdery mildew than M. didyma (red). 2. Aster Nova-angliae. late season nectar source (for Monarchs, too). 3. Eupatorium purpureum, Joe Pye weed. 4. Penstemon digitalis, foxglove beardtongue, native. 5. Veronicastrum virginicum, Culver’s root. Blooms late summer. 6. Helenium autumnale, Sneezeweed. Deer and rabbit repellant. 7. Lupinis premis, Sundial lupine. Host plant for butterflies and native to Vermont. 8. Lonicera sempervirens, Trumpet honeysuckle. Native and blooms June to September. 9. Echinacea purpurea, purple coneflower. native to NY and CT, composite flower. 10. Agastache foeniculum, anise hyssop. Native to NY and NH. Other ways to promote habitat? 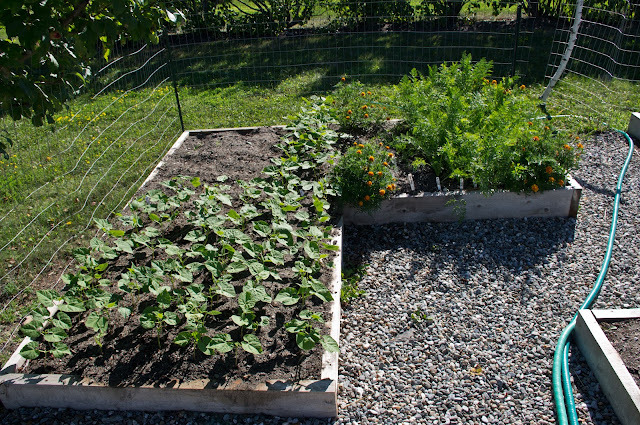 Seventy percent of bees live in the ground and these include the squash bees that nest in the ground near the squash and cucumbers they pollinate. 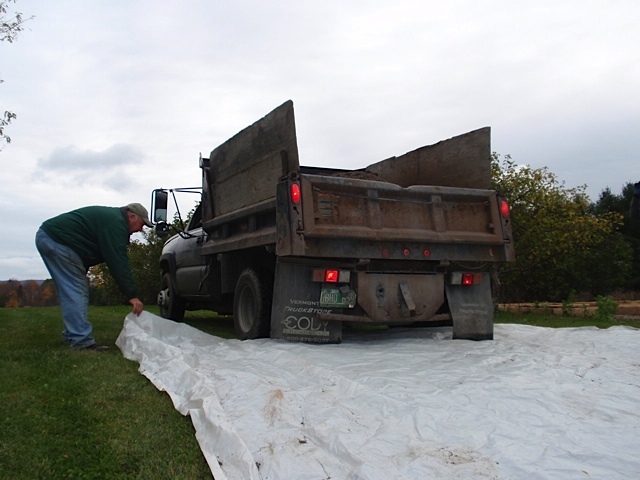 Preserve areas of bare or sparsely vegetated well-drained soil and avoid compaction of same. Also preserve dead or dying trees and hold the fall clean-up since tunnel nesting bees rest in the debris. 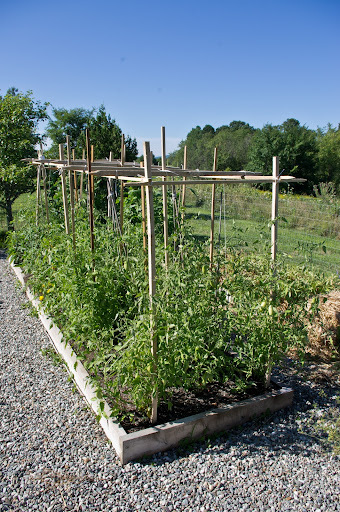 Create your own wooden net blocks or bundles of hollow stems. 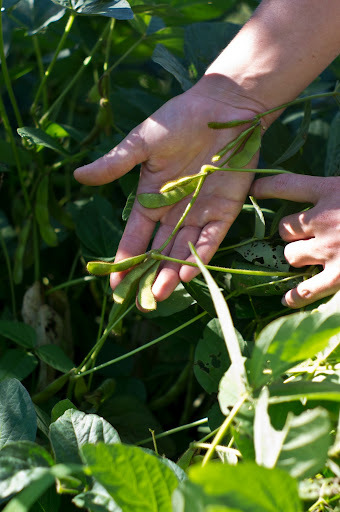 Avoid using insecticides containing systemic neurotoxin neonicotinoids especially Imidacloprid and Clothianidin that linger in the soil and can remain active for a year or more. Neonics are absorbed by the plant and dispersed in plant tissues including pollen and nectar and they are toxic to bees and beneficial insects. Although there is conflicting evidence that neonicotinoids cause colony collapse disorder for honeybees, there is increasing evidence that topical or ingested exposure in bees retards colony growth, impairs navigation and foraging behavior and may increase their susceptibility to other pathogens such as mites, bacteria and fungal infections. See Friends of the Earth Bee Safe Gardening Tips for a full list of neonics to avoid. Annie White, UVM Graduate Research Assistant. Presented at 2013 Flower and Garden Show, Burlington, VT. At PollinatorGardens.org, see “Top ten perennial plant choices for pollinators” and “Designing pollinator-friendly landscapes”. 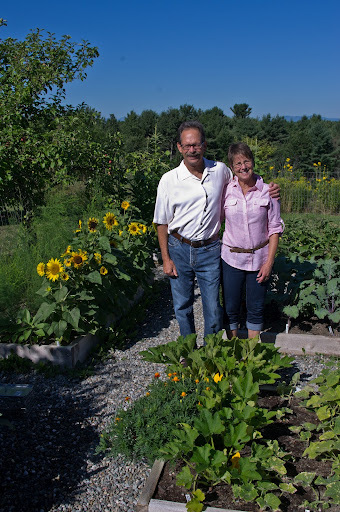 “Enhancing Pollinator Populations for Farms and Gardens”, presentation by John and Nancy Hayden of The Farm Between at NOFA Winter Conference 2014. At thefarmbetween.com, see full powerpoint presentation and info on June 30th, 2014 Pollinator Workshop. 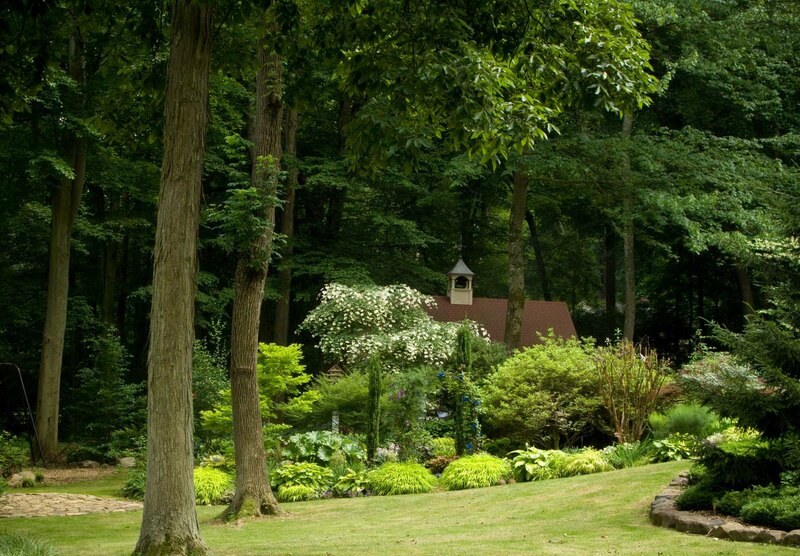 It's time to think spring and what better way than to share pictures of our gardens? We think all garden photos deserve to win, so this is not a contest in the traditional sense since we will select the winner randomly on Monday, January 31. The prize? 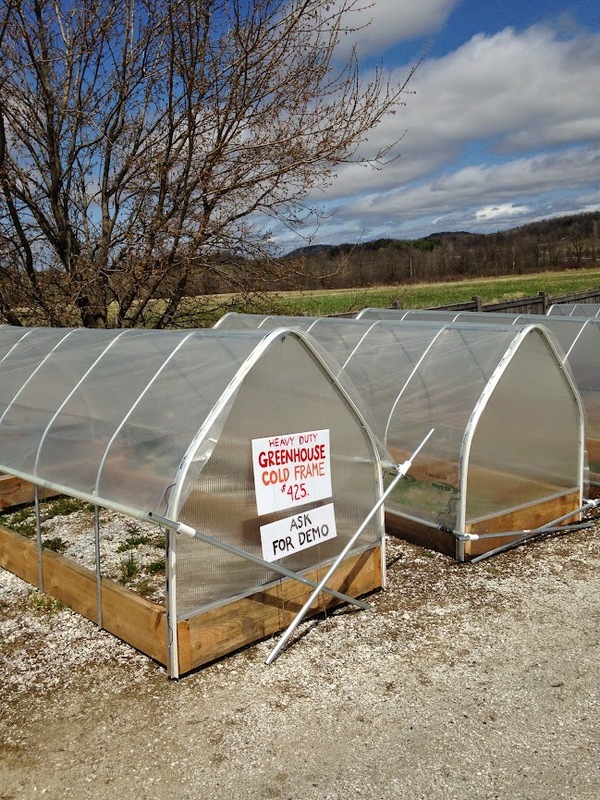 A $20 gift certificate to be redeemed at our Hinesburg greenhouses. Send your pics to us via email (julieATredwagonplants.com) or post to our facebook page. We will publish all the photos on our website and create an album on Facebook. What could be more inspiring than thinking about what is under the snow, patiently waiting to push through. Keep warm and dream on! From Julie.... 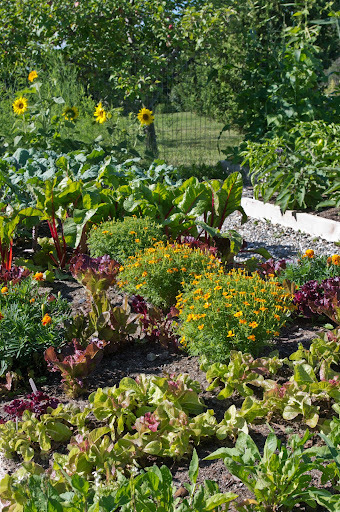 There are a few garden and farm writers out there that move me to no end. I have had a fascination with homesteading literature since I was a little girl and still to this day I love to pour over books, catalogs, websites and blogs that have to do with growing food, living off the land, making do with things that are around the house, etc. Within this genre, one of my absolute favorite writers is Jo Ann Gardner. She has written eloquently about the plants she loves for decades and I have poured over some of these books countless times. 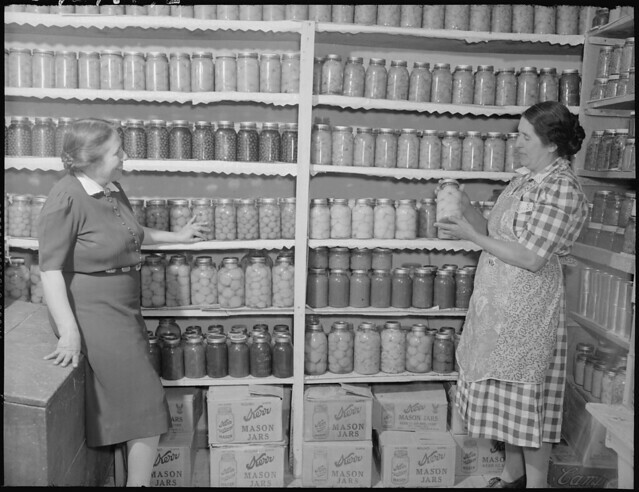 She and her husband were once back to the landers in Nova Scotia, far off the beaten path, and were able to make a livelihood for themselves in a very short growing season and on very challenging soils. Her writing reads like a series of love letters to a set of handsome, rugged plants that got them through tough times. I am absolutely honored to have Jo Ann visit our greenhouses this Saturday and to share some of her plant knowledge with us. 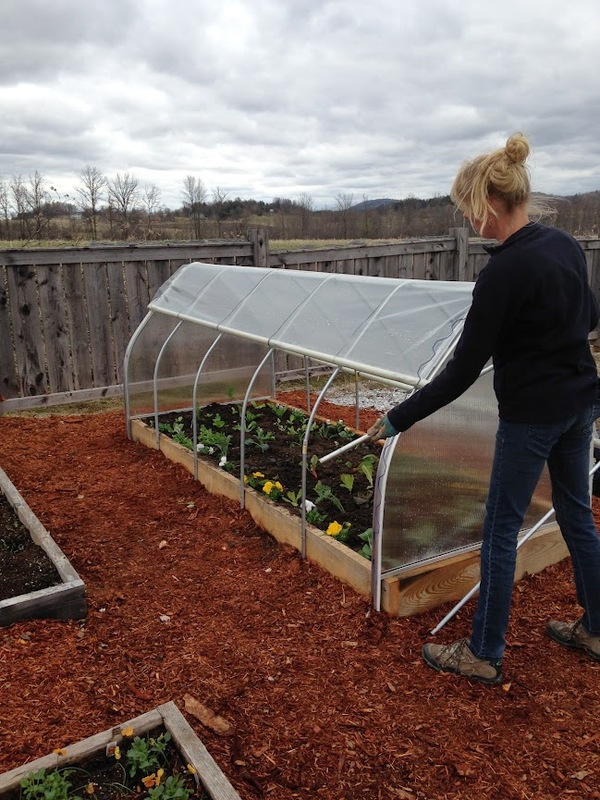 She now lives across the lake, in Essex, NY and is active in gardening efforts at home and at a local senior center. Her talk on Saturday will focus on how to use herbs in pots and containers around the home. I am sure she will bring along her wit, thrift, and cleverness and we will all be a little richer for it. Brown Dog Books in Hinesburg is carrying her books, and they will set up a table at our greenhouses on Saturday for those of you who may wish to purchase one or two. But be warned - Jo Ann's writing will fuel the fires of any gardening addiction. 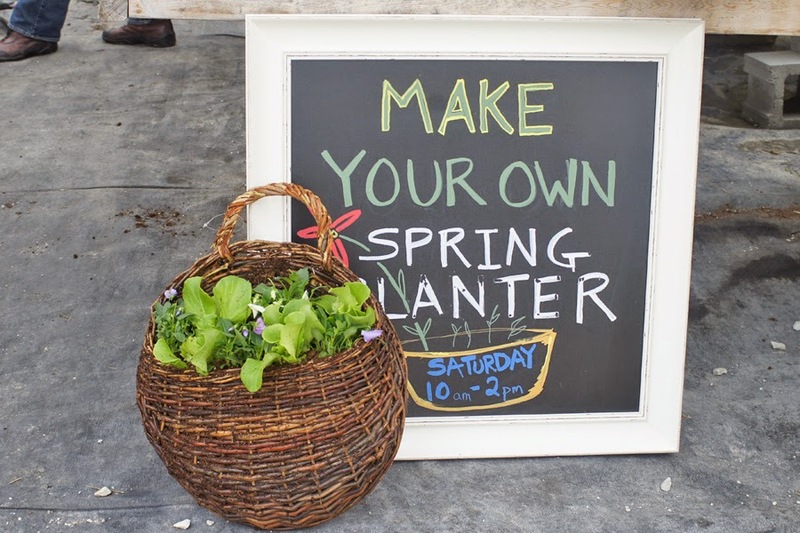 Also present on Saturday will be Jess Bongard, of Sweet Lime Cooking Studio. She will be bringing us some herb treats to sip and snack post-workshop. Coincidentally, Jess is teaching an herb class in her home kitchen on Sunday. You can read about it here. A group of us are going from Red Wagon, making it a party, I am sure. I like June. 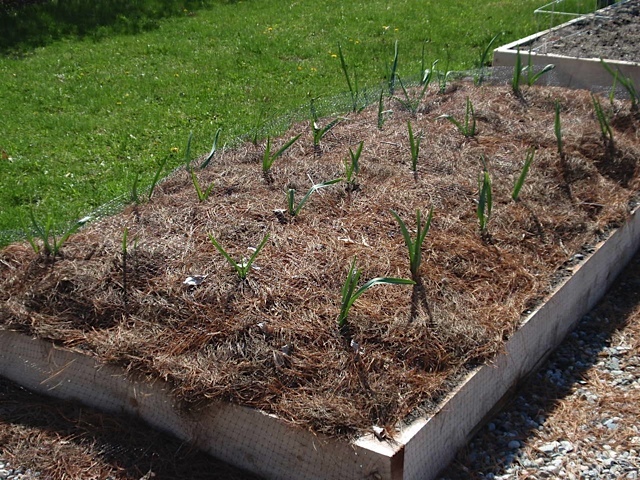 The bulk of the spring planting is done. The porch is swept off, and it is just the right time to sip a lemon verbena iced tea, make a lovage and butter sandwich, and gaze lovingly at all the herb pots surrounding the patio. I hope to see some of you this Saturday. Psst...there are only a few slots left, so please call or email to register. 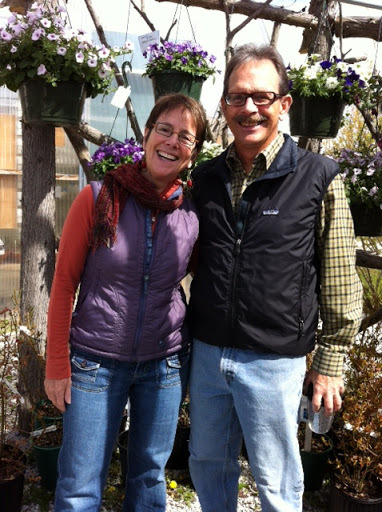 Meet Lori and Doug, two of our favorite long-time customers and friends. 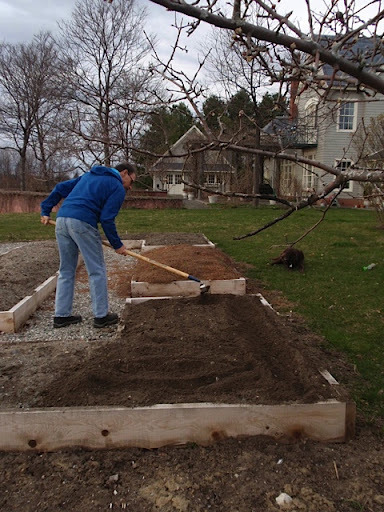 Our skillful and talented guy, Eric Denice, built them some beautiful raised beds and they've been busy planting. 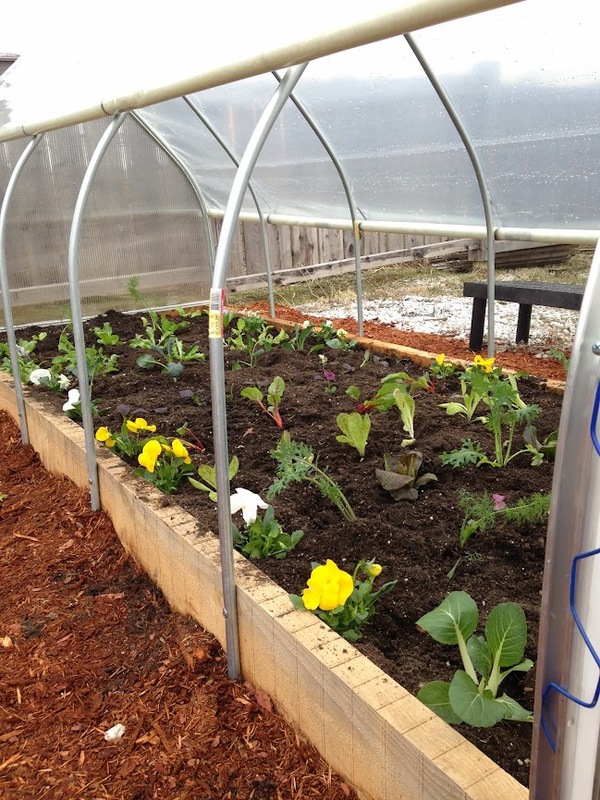 Check out what's sprouting in their garden. These photos are from a few weeks ago, and we are updating them as we find time....so stay tuned to see more of this great progress. 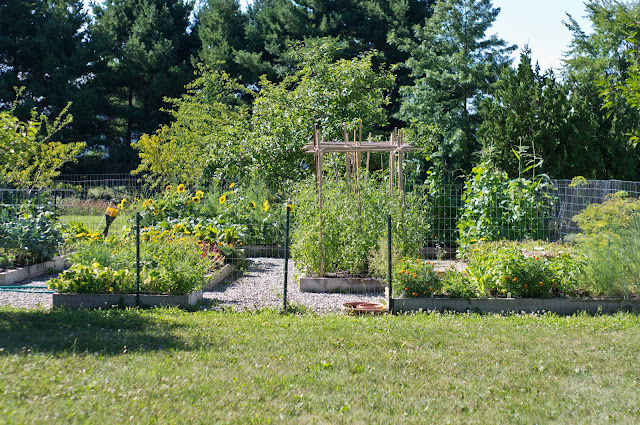 I think some incredible meals will be coming out of this garden and kitchen this summer. Keep checking in to see the changes! Meet Lori and Doug, two of our longtime customers and friends. Last year, they visited the greenhouses repeatedly, making large purchases of vegetable plants, it seemed every day. I finally asked them if they were starting a small farm, and they admitted that they were having some problems. Apparently, everything kept turning black and dying. This does not usually happen to our plants, so I offered to visit their garden, which happens to be on the way home, and they happen to have very nice wine to offer, so it seemed like a win-win. Lo and behold, their beautiful garden site was also the low lying spot where their entire property drains. The plants were sitting in standing water (remember all the rain last year?) and were drowning. I advised them to just start over, sad as that is, because there was just no way to grow in that site. 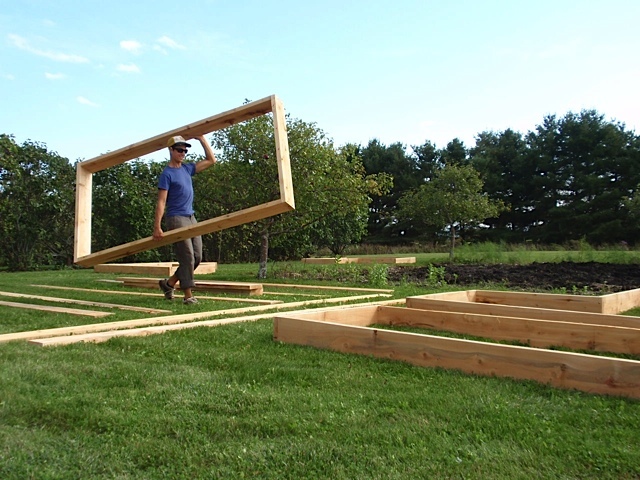 They asked us to help them build a big beautiful raised bed garden, so we set our expert carpenter and all around handyman, Eric Denice, to the task. Here's what they created together. 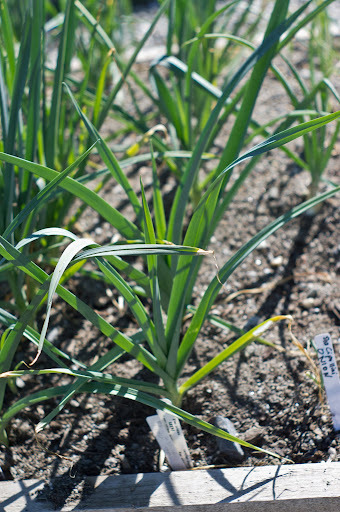 In the fall, Lori and Doug planted garlic, which is now growing beautifully, and each week, they come in to let us know what they are up to and we help them pick out plants that are appropriate for the weather. It has been such a fun project and we are grateful to Lori and Doug for including us! Please keep checking back for updates as we chronicle the progress of this great garden and its people. Home orchard, here I come. Trees are grafted, unless you dig them up out of the woods. Which is not a good idea, since you would be getting something not bred for fruit production and possibly disease laden. Trees are grafted in order to provide strong root stock in combination with a "top" that is bred primarily for eating quality. In addition, apple trees are often grafted onto a "dwarfing" root stock which will keep the tree from towering above you, fruit out of reach. When planting, look for what is called the "graft union" - it is a slight bulge at the base of the trunk where the root stock and the top meet. This union should be about 1" above the soil line once planted. 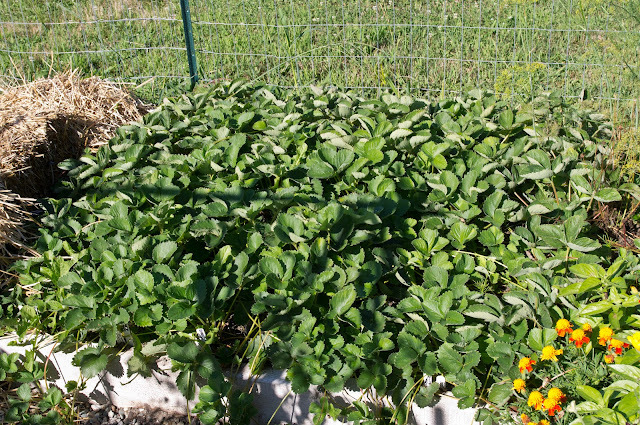 If you plant it too deeply, you may trigger the root stock to take over the top growth and this would not provide you with the best eating fruit. 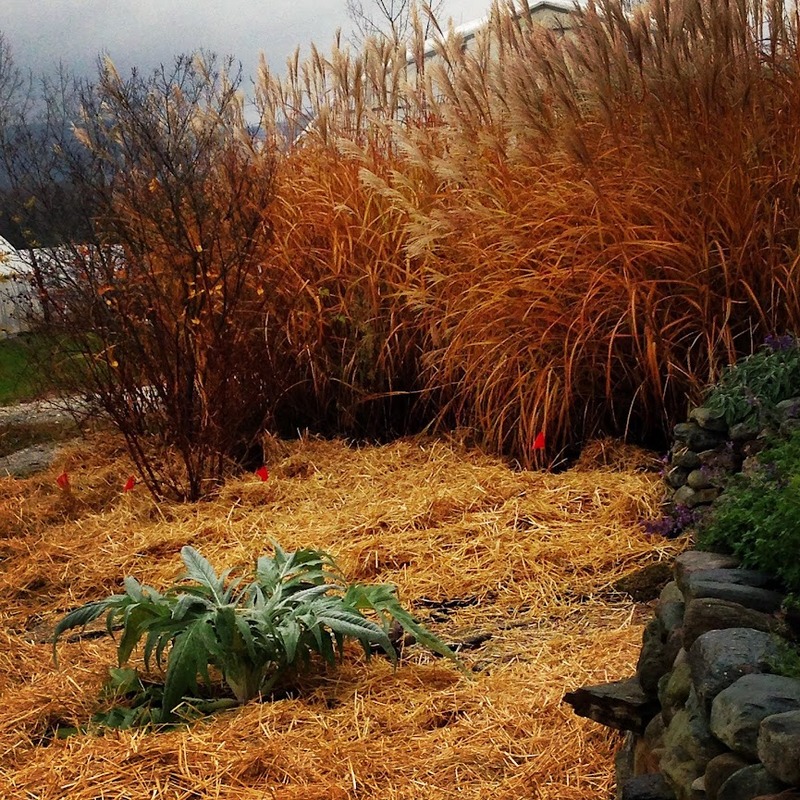 At planting time, use only the native soil in the planting hole. Dig the hole so that it is 2 to 3 times wider than the tree's container or root ball. Do not go deeper than the container or you risk planting the tree too deeply. 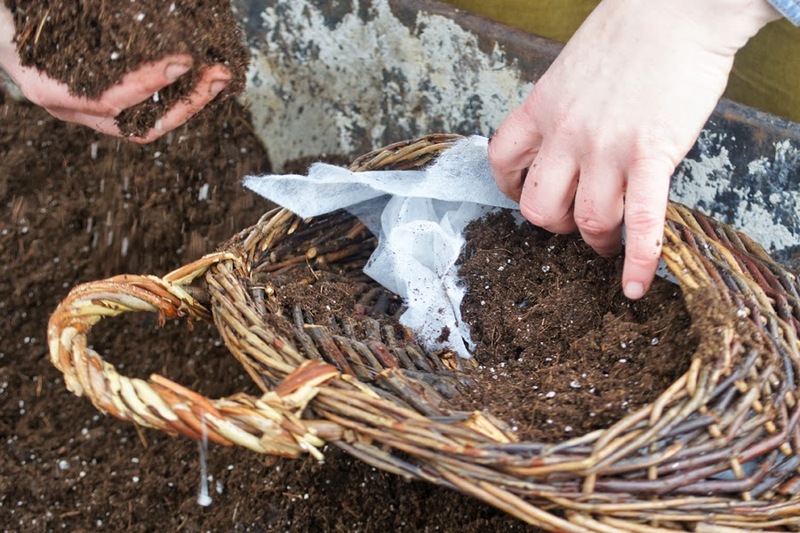 If you add compost to the planting hole, the roots will never have to reach out and search for food in the native soil and the tree's root system will never develop fully. When purchasing a tree, look for even lateral branching (called "scaffolding"). The first two years of a fruit tree's life are the non-bearing years. It is important that the tree puts its energy into being strong and vigorous, not into making fruit. So, sadly enough, you must pick off the blossoms so that fruit does not form. This difficult task will reward you with bigger and better fruit on a healthy tree in years to come. After Charlie's talk, I dutifully went home and stripped my plum tree of its recently formed flowers. Spacing of trees is equal to their height. In other words, if a tree is going to be 15' tall, you need to plant it 15' from its closest neighbor. Pitted fruits like plums, cherries, peaches, and apricots do not do as well on clay as apples and pears do. If you are like me, and live in a clay pit, look for the best drained site and consider digging some trenches to direct the water away from the orchard. 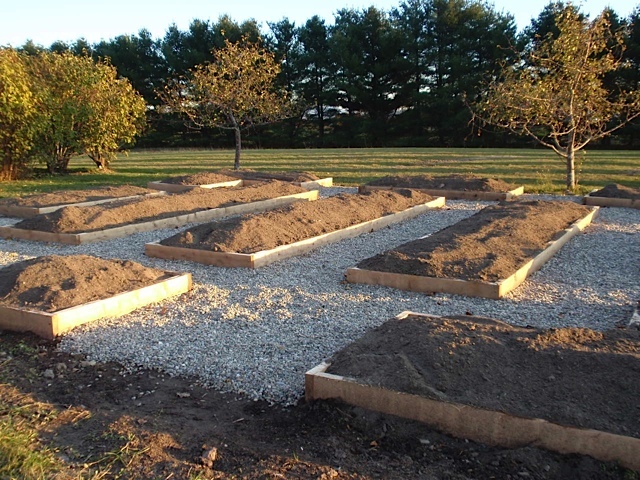 Amend the soil by layering in compost and other nutrients on the soil surface (not right up against the trunk though) after planting. This should include compost, some additional nutrients based on soil test results, woodchips from hard woods (which promote beneficial fungal activity), and a little woodash (only about 1 cup per tree). 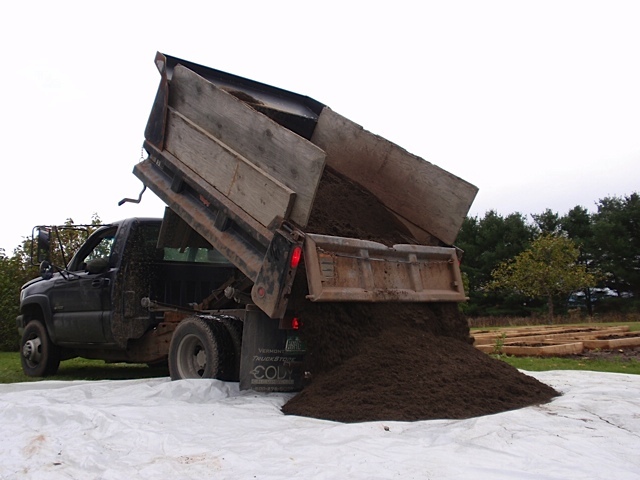 Vermont Compost Company's Perennial Blend is a perfect material for mulching around the base of the fruit trees. It includes compost, micro-nutrients, macro-nutrients (NPK), and an extra shot of bark, which is high in lignans and which promote the beneficial fungal activity trees love. 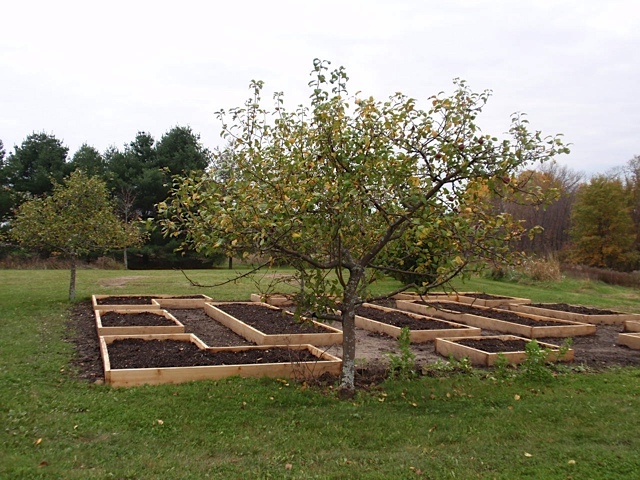 A north facing slope is the best spot for a home orchard - it heats up a little later in the spring and keeps the trees a dormant a little longer. 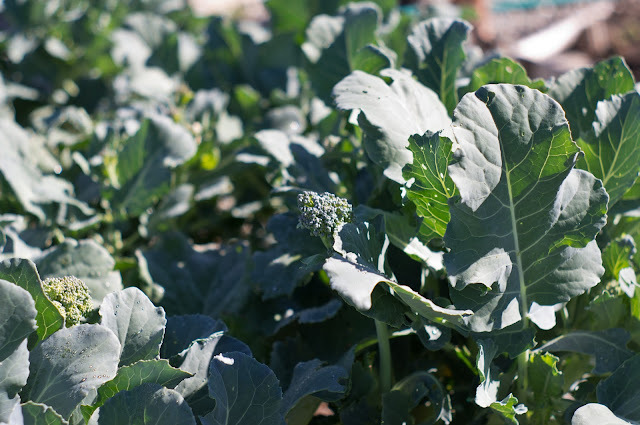 This delays bud formation which lowers the risk of a frost zapping those early flowers. A north facing slope also has good air circulation and frost tends to blow away before settling into a valley or dip. Fruit trees are best planted in pairs, and their planting partner should be a different variety or cultivar. This diversity leads to better pollination which equals more fruit formation. For example, a Liberty apple, should be planted near a Honeycrisp, or a Parker pear should be planted with a Summercrisp pear. I think I will try a few cherry trees and pears this year. I have a spot picked out, on the north facing slope outside our kitchen window. And maybe once those are in, I will start to imagine some blueberries and raspberries nearby....closer to the house than the ones I planted when we first moved here. 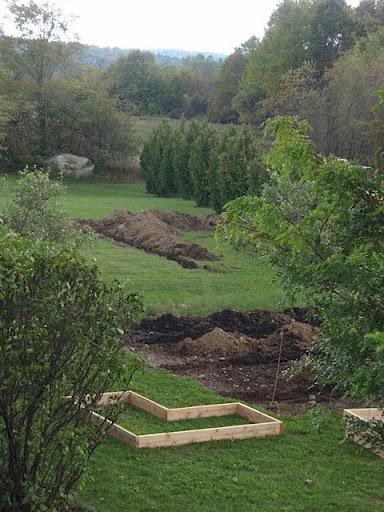 One thing I am glad about....my years of procrastination with the back yard means that I have a blank slate and the home orchard can be very close to the house; it will be landscape and larder, all in one. 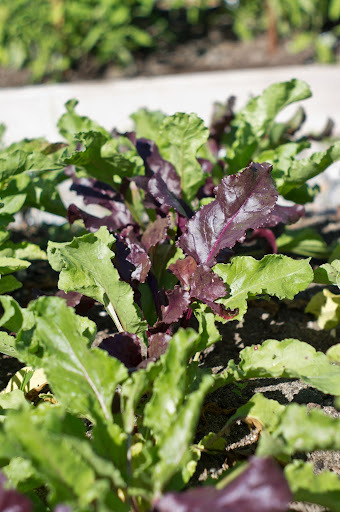 FAQ #20: Do I have enough sunlight for this plant? First you need to determine if you have full sun, partial sun, or full shade in the area you are considering. The best way to do this is to spend a day at home and note which areas come into sun and when, and when they are in shade again. Do this in spring when you have a realistic amount of sunlight, not in summer when the day is longest. Full sun means at least 6, but preferably 8 hours of direct sun each day. Sun loving plants can usually survive with less but will not bloom as much. 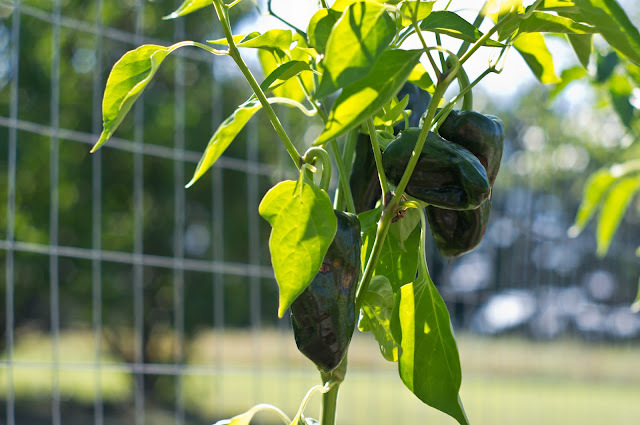 Part sun and part shade plants prefer 3-6 hours of direct sunlight per day; however part sun plants can usually take more heat than part shade plants, which will want relief from strong afternoon sun. Full shade means zero to 3 hours of direct sunlight. These plants do NOT want total darkness but rather filtered, or indirect light, such as that provided by a deciduous forest. 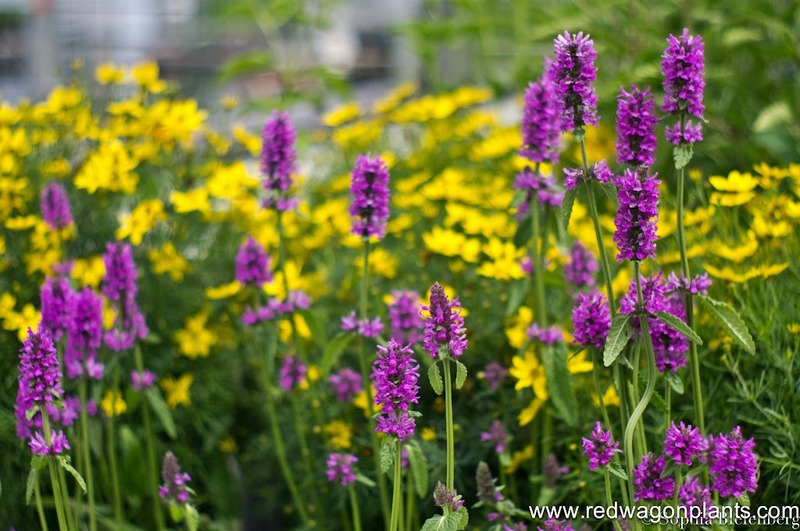 FAQ #17: Should I plant annuals or perennials and what’s the difference anyway? It depends on what you want! Annuals have to be planted each year because they are tender and don’t overwinter in VT, so you have to buy new ones each season. However, once they start blooming, they do so all summer, if you take good care of them. 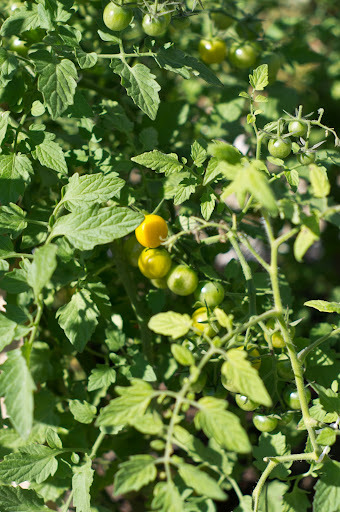 At the end of the summer just pull them out and throw them in the compost pile. Perennials are long lived, often indefinitely, but only bloom for a part of the season. 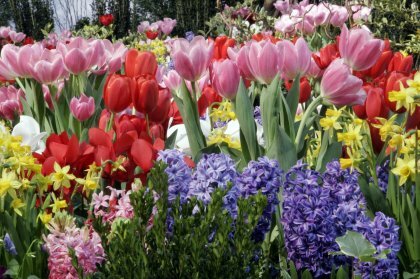 In order to have color all season, you need to plant a wide variety of plants. 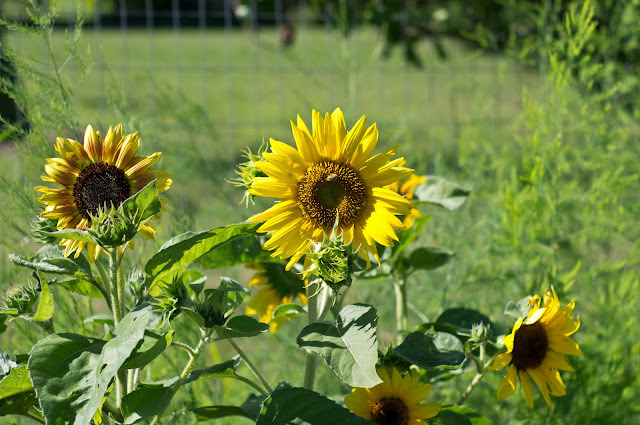 Some need to be cut down after blooming and you may have an empty spot in your garden. 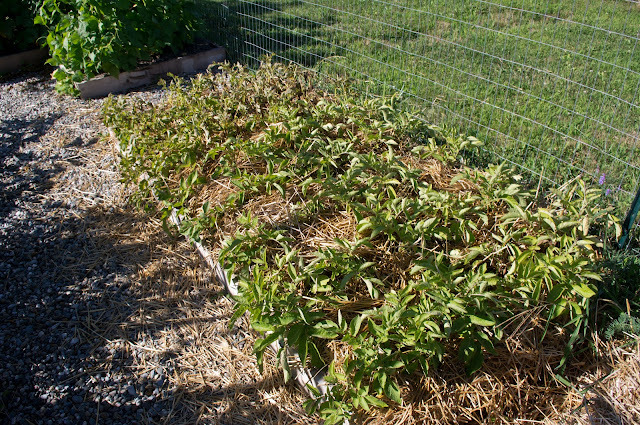 Most perennials need dividing in order to be at their best and not look scraggly or take over the garden. Often a mix of annuals and perennials works well to ensure constant color in the garden. 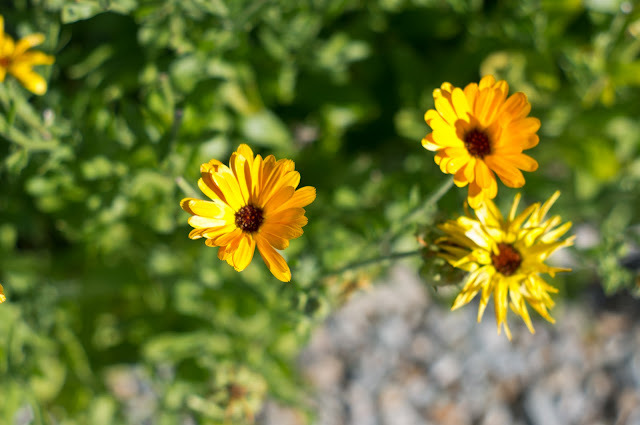 Biennials are plants that live for two years but behave somewhat like perennials because they flower and self-seed in their second year, and the seedlings will return year after year. Hollyhocks are a good example.